Ballymount Retail Centre is made up of 9 units and overhead offices. 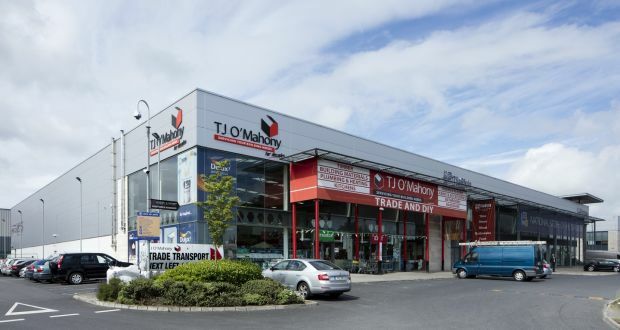 A leading retail park anchored by the high-profile company Tilestyle in west Dublin goes for sale on Wednesday at a guide price of more than €13.8m, which will give a new owner a net initial yield of 8.48%. The centre was developed in 2006 and has two detached blocks on a site area of just under 5 acres. The 9 retail units on the ground floor and office facilities on the first floor extend to 9,027 sq.m (97,165 sq.ft) and are producing a rental income of more than €1.22m a year. More than 85% of the rents come from leading retailers, including Tilestyle who pay €521,000 per annum; TJ O’Mahony (€150,000); office tenants SIG Building Products (€316,000); and Spar (€112,000). The park has a weighted-average unexpired-lease term of more than 7.49 years. Block A has a floor area of 5,385 sq.m (57,965 sq.ft), which is shared by TJ O’Mahony and Tilestyle. Block C has seven ground-floor retail units, two of them vacant, along with overhead offices, with an overall floor area of 3,641 sq.m (39,201 sq.ft). Dolan describes the Ballymount facility as a “well-secured high-yielding retail investment with the potential to further grow income returns via the implementation of a number of asset management opportunities”.